This article has been a long time coming! 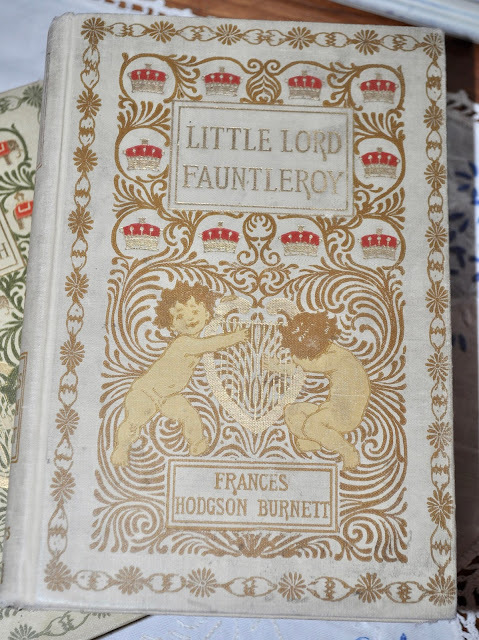 Waaaay back in May 2016, I told you about an antique copy of Little Lord Fauntleroy that I found on my city library's book sale shelf. I did go back and get it that pay day, but haven't posted here yet because I had found something even more exciting! 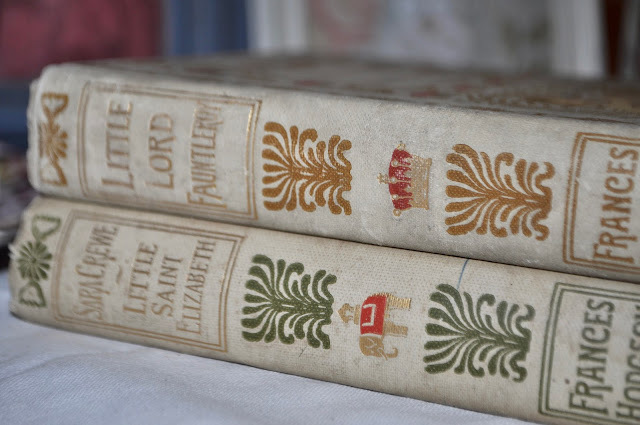 Within the same week of finding this gorgeous copy of L.L.F., I saw that Michael Popek, author and bookseller, had a matching copy of a book I'd never heard of! 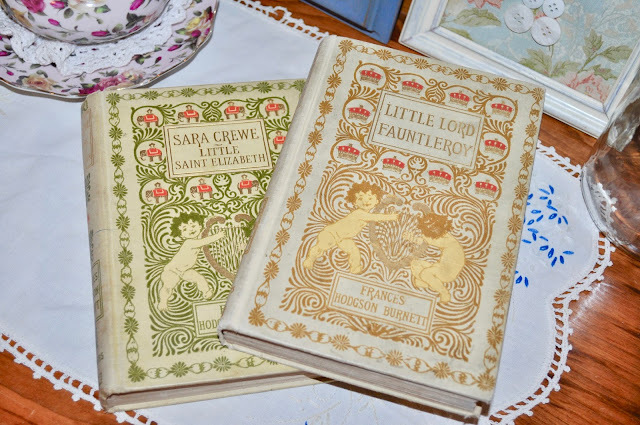 One of Hodgson Burnett's most famous stories is that of A Little Princess, published in 1905. It featured Sara Crewe, the delightful daughter of a British Captain stationed in India. 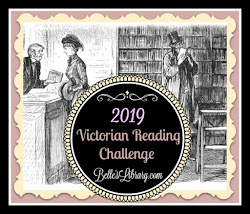 However, I was not aware that the novel had begun as the short story, Sara Crewe: or, What Happened at Miss Minchin's, published 17 years earlier in 1888. This very copy was featured on Popek's site, Forgotten Bookmarks, before I snatched it up! 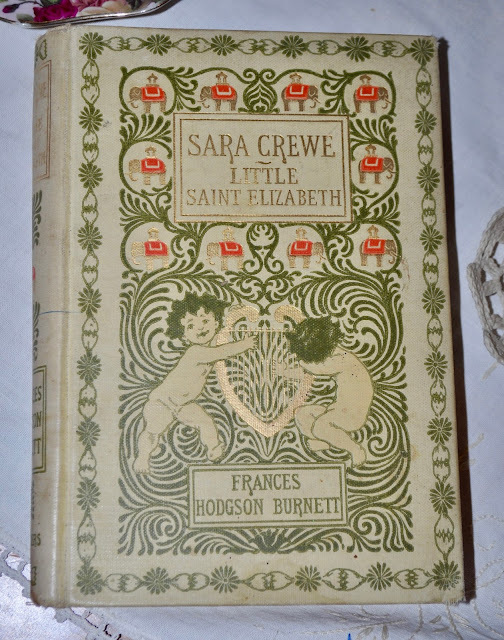 It's called Sara Crewe, Little Saint Elizabeth, and Other Stories, published in 1898. I love the cover design on these. Little Lord Fauntleroy features a crown motif around the title, while Sara Crewe is decorated with Indian elephants. I'm so excited to read these lovely copies. I'll let you know what I think when I'm through! What an exciting find! I'm so happy for you! That's so exciting!!! I know you were thrilled. Our local theater company recently did a production of The Secret Garden and I was so excited to attend. My daughter got tickets and we attended together with my eight-year-old grandson. Imagine my shock when I saw ghosts and evil spirits in the play. Not only that, but there was a long and very loud scene where the characters and ghosts danced around the crippled boy - casting a spell to heal him. I was horrified!!! I certainly don't remember any such thing in the book, and am going to re-read it to make sure.